The Die D'Lites dies are fabulous! Here's a card using the poppies from the Asters and Poppies set inside the Filigree Vase. 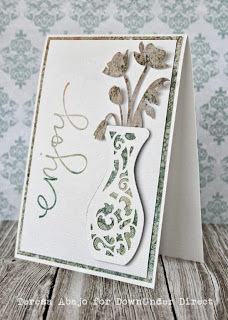 I have used three Versamagic inks on the word stamp to mimic the background paper. I think I'd describe the look of this card as serene.